A study led by researchers at the ARC Centre of Excellence for Coral Reef Studies at James Cook University found fish become anxious and more cautious when water quality is degraded by sediment, an effect that could stunt their growth and damage their health. Senior author, Associate Professor Jodie Rummer says there is more sediment in coastal waters than ever before. “Suspended sediment concentrations in tropical coastal waters have increased substantially over the past few decades as a result of human activities. We wondered if this reduced visibility affected fish performance, especially their ability to escape predators,” she said. 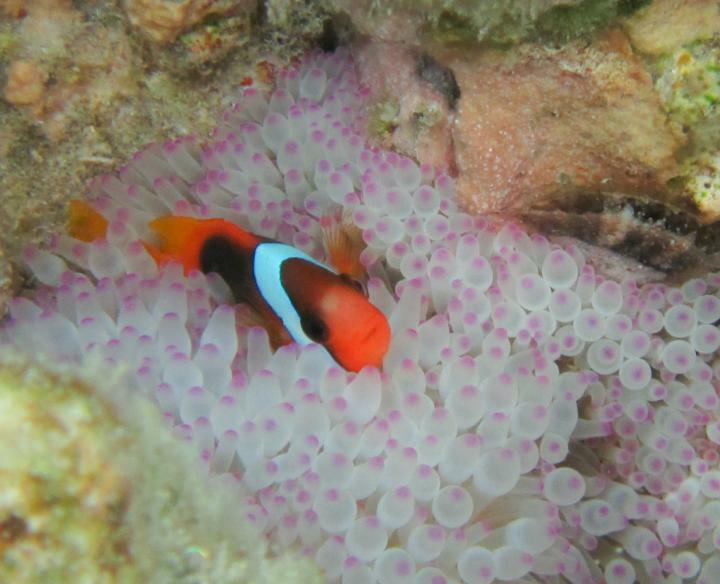 The scientists, led by PhD student Sybille Hess, examined the response of one-month-old cinnamon anemonefish to a simulated predator attack after they had been living in a sediment-filled tank for seven days. “We found the fish responded faster and were able to dart away from the simulated predator attack more effectively than those living in clear-water, which suggests the fish are on high alert owing to the decrease in visibility,” said Ms Hess. She said fish in turbid water were also less active when looking for food and avoided open areas. Dr Rummer said the additional energy spent avoiding predators reduces the energy available for growth, maintenance and reproduction, and may ultimately have equal or greater effects on prey populations than predators themselves. She said that while juvenile anemone-fish frequently migrate between sea anemones, with which they have a symbiotic relationship, such behaviour could be too risky under turbid conditions. “More cautious behaviour, such as we observed in elevated suspended sediments, may not only reduce movement within their home range, potentially limiting their access to food, but may also reduce the ability of juveniles to find a suitable anemone to call home. Dr Rummer said predators that depend on clear water conditions to catch their prey may also be affected by turbid conditions, which will be the next question for the team to investigate.